Qin Shi Huangdi likely qualifies as the most ambitious 13-year-old who ever lived. In 247 BCE, when he ascended the throne of Qin, one of the many warring states that competed for territory in what is now modern China, he set for himself two goals: to conquer all the rival states and to create a magnificent tomb that would contain a replica of his kingdom. In 221 BCE, he succeeded in his first goal and became the first emperor of China. (Some scholars believe that Qin, pronounced "Chin," is the root of the word "China.") The second project (the tomb) was ongoing until his death in 210 BCE; it would expand to become an underground complex covering ten square kilometers inside a hollowed-out mountain just east of the city of Xi'an, guarded by an army of 6,000 terra-cotta warriors and horses. It was so well-guarded that it remained undiscovered until 1974, when a farmer accidentally stumbled on one of the soldiers' heads while digging a well. 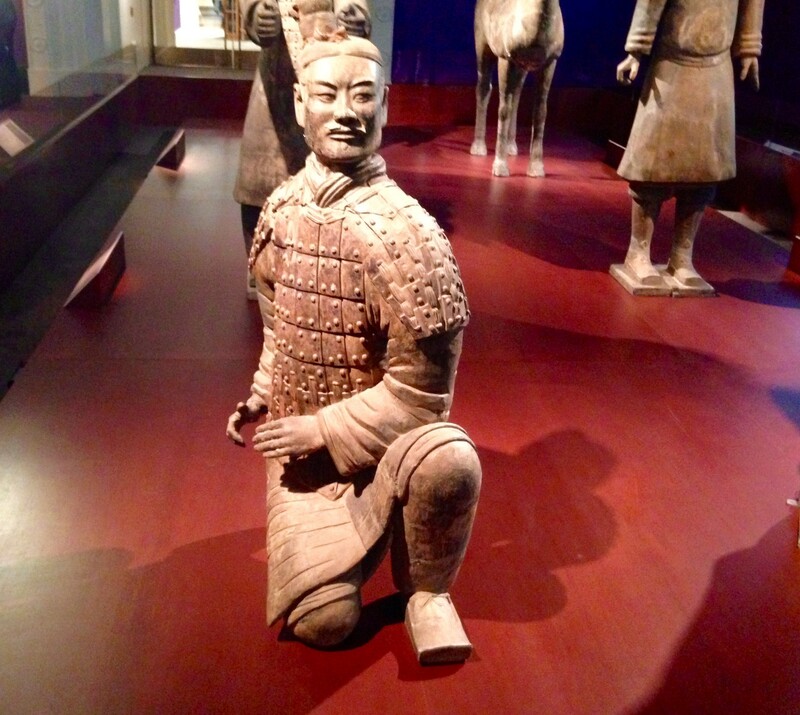 Now five of those soldiers, plus a general, a government official (because someone needed to run the kingdom), an acrobat (because the emperor needed entertainment in the afterlife), and a horse have traveled to the Field Museum, where they will remain on display until next January. A picture of the soldiers in their natural habitat. A wooden ceiling fell on the soldier pit, shattering most of the statues, which have since been reassembled by conservators. The exhibition is the result of nearly five years of discussion between the museum and officials in China's Shaanxi province. The Field has enjoyed friendly relations with Chinese authorities since the Cyrus Tang Hall of China opened last summer, and Chinese officials consider the figures "ambassadors of Chinese culture," in the words of Zhou Tie, the chief conservation scientist from the Emperor Qin Shi Huangdi Mausoleum Site Museum, but negotiations over the terra-cotta figures involved a great deal of back-and-forth over e-mail and Skype and in person, during Chinese banquets. This is the first time some of the figures have ever left China. "They came over very gingerly," says Gary Feinman, the museum's curator of Mesoamerican, Central American, and Asian anthropology. "Each one looked like a person who had been injured in an American football game. They were strapped to a stretcher with foam padding. The heads were packed separately." 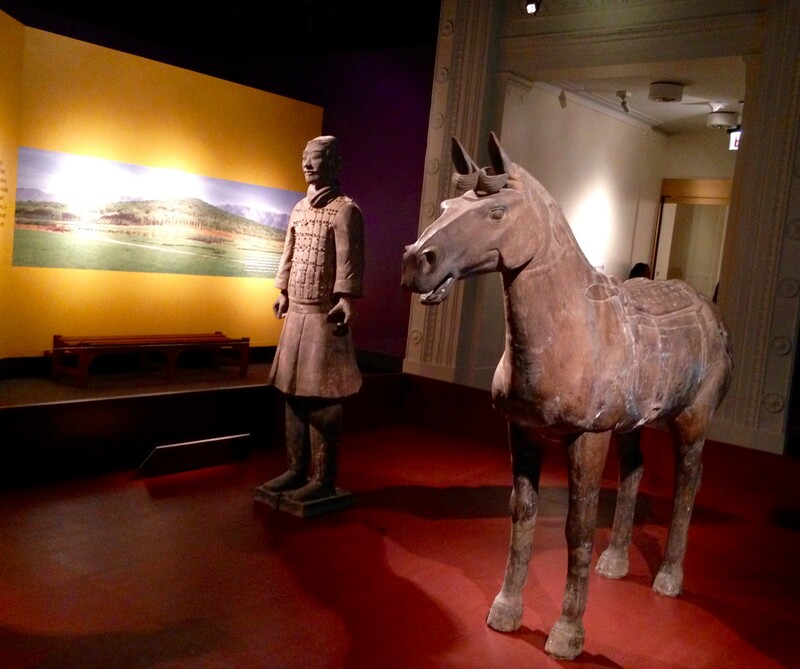 The five soldiers and the horse stand in formation inside the museum, much as they did in their pit in front of the emperor's tomb. The general, official, and acrobat stand apart, in separate glass cases; the acrobat has yet to be fully reconstructed and is missing his head. 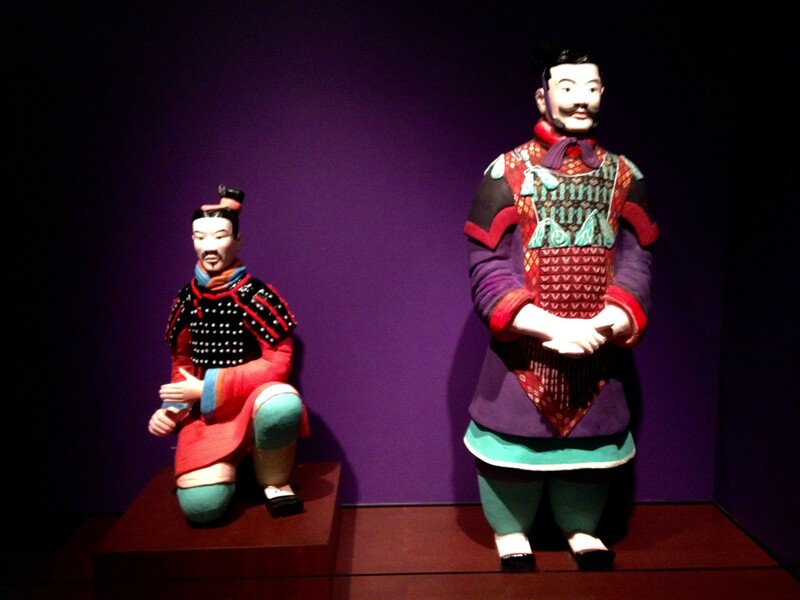 Each soldier is about six feet tall, nearly a foot taller than an actual Qin dynasty soldier; the general, naturally, is the tallest. Workers put the finishing touches on a soldier. A series of miniature sculptures depicts the statue-manufacturing process, largely carried out by another army of tens of thousands of convicts and conscripts, some of whom died on the job and are buried at the site. Banners hang from the ceiling of the exhibit to show the individual faces of the soldiers, created by molds and then finished by hand. The terra-cotta army is the best-known part of the complex, but the underground kingdom expands far beyond that. So far, archaeologists have uncovered another pit of terra-cotta statues of government officials, a terra-cotta stable boy keeping guard over a burial ground for the emperor's horses, another burial site for the birds and small animals in the emperor's menagerie, and an underground waterway filled with terra-cotta statues of birds and human musicians. There is also an elaborate drainage system to keep the interior from flooding. Of course the central and most important part of the burial site is Qin Shi Huangdi's tomb, but no one has opened it since it was sealed more than 2,000 years ago. There are two reasons for that, says Feinman. First, about a century after the emperor's death, historians began to write accounts of his reign that claimed that rivers of mercury surrounded the tomb. And, sure enough, modern scientists have found traces of mercury around the tomb. (One of the historians' other claims, that Qin Shi Huangdi buried builders and craftsmen alive, has yet to be substantiated.) The second reason is that conservationists don't want to accidentally damage anything that's inside. 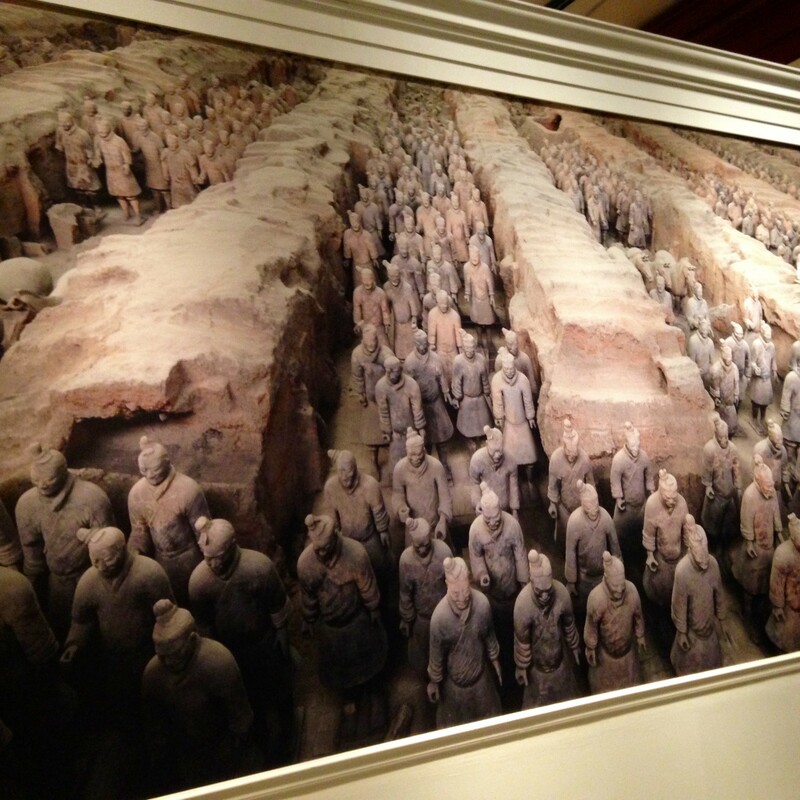 "The Chinese officials are planning to do the excavation very carefully," says Feinman. "The laboratory excavation will be slice by slice, sealed hermetically so they can move the sediments." Horse and charioteer. 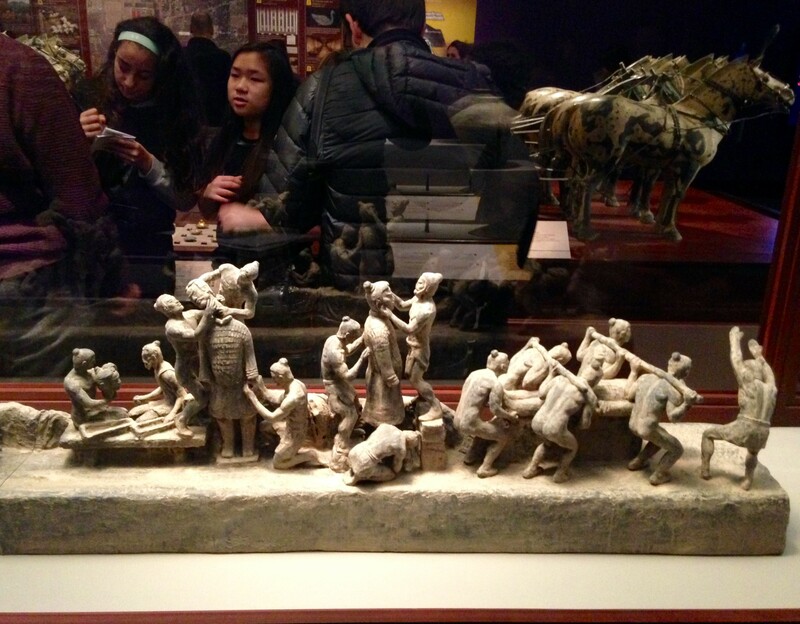 The chariot was made of wood and disintegrated; the exhibit includes a few replicas. The Field exhibition contains evidence of several other artifacts of Qin Shi Huangdi's reign: pottery and weapons, mass-produced banliang coins with square holes in the middle so they could be carried on a string, and weights that were part of the emperor's standardized system of measurement. Qin Shi Huangdi also began work on a great wall to protect the northern part of his territory, a precursor to the Great Wall. But arguably the emperor's greatest achievement was the tomb complex that, as a bit of wall text helpfully notes, is the size of 2,317 Field Museums. Even for a guy who was considered divine but was also preoccupied with death—he survived numerous assassination attempts, though he appeared to have died of natural causes—it's a creation of astonishing arrogance. If you can't get to Xi'an anytime soon, this might be the next best thing. 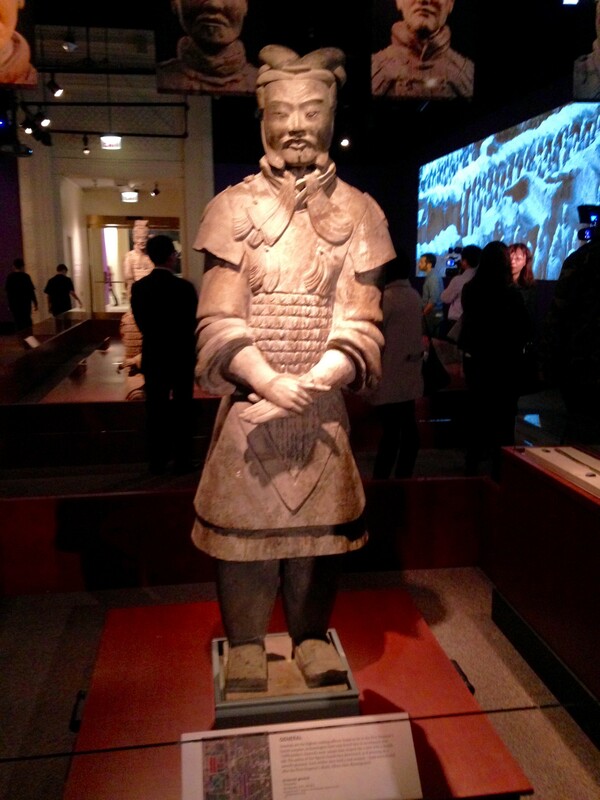 "China's First Emperor and His Terracotta Warriors" runs 3/4-1/8/2017. It's a little overwhelming, but it's permanent, so we'll have years to explore.